Cycling Weekly visited the London velodrome in September 2010 while it was being built to interview track designer Ron Webb. This is the feature that appeared in the November 25th, 2010 issue of Cycling Weekly. After completing construction of the Newport track in 2003, Ron Webb thought he had finished with building cycling tracks. With Olympic tracks in Athens, Sydney and Seoul, Commonwealth Games tracks in Edinburgh, Manchester and Melbourne and the installation and construction of countless other tracks under his belt, the Australian’s work appeared done. Both physically and conceptually, the track is central to any velodrome. To design the track then build around it “is the only way to do it,” Webb asserts. 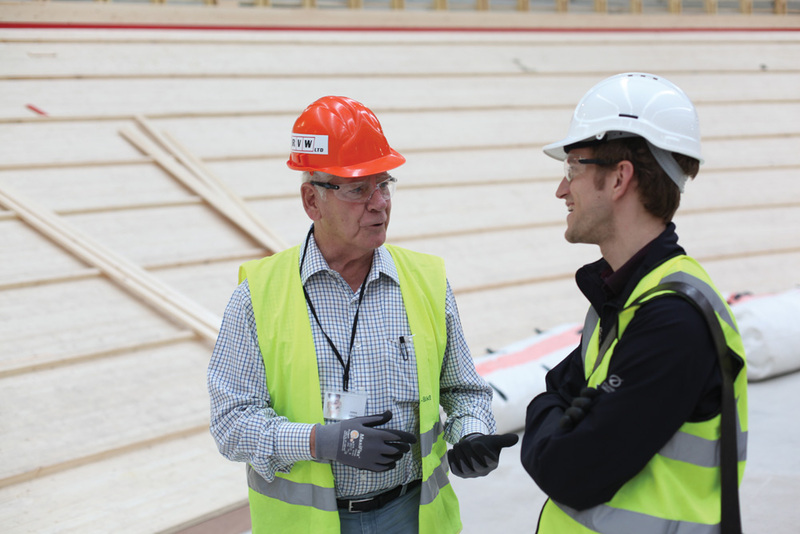 And indeed when we entered the London velodrome to take a look at the project ourselves, it was the wooden surface of the 250-metre track that immediately grabbed our attention. Maybe it was the lack of clutter in the track centre. Or that racing lines had yet to be painted on the boards. But from where I stood in the track centre, it looked wider and more circular than most other tracks I’d visited. Webb admits he has obsessed over the exit from the banking ever since he was a professional racer himself. Behind the big motors at 90kph, he really got the feel for the difference between a good and bad exit. “The whole secret of a bike track is really that exit from the curve and the way it joins on to the straight,” he said. “The wider the curve, the nicer it is. If someone is trying to pass on the curve, then they can ride shoulder to shoulder. 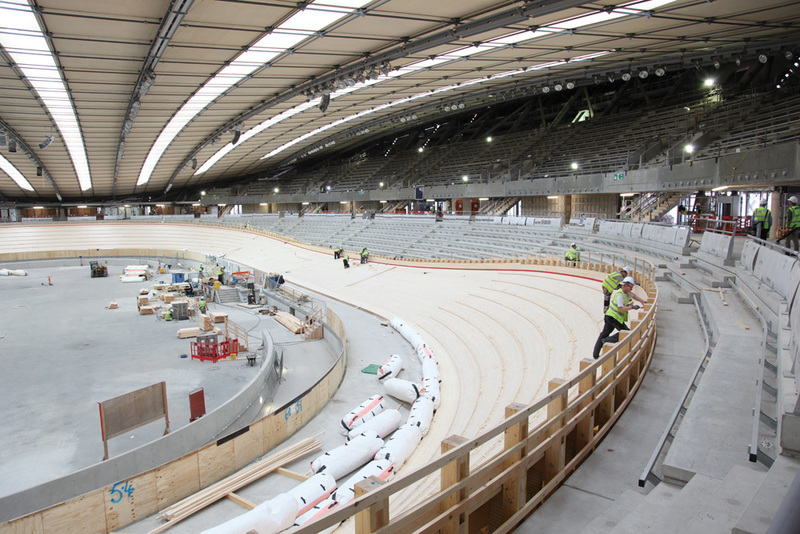 Given Webb’s attention to detail and London’s expectation to host the best games ever, the ODA has been hyping London’s new velodrome to be the fastest in the world. Webb, however, is not so keen to toe the party line. Although, as Webb says, it is ultimately the people on the boards who define the quality of the action, the atmosphere of the whole theatre will also have an effect. Although Webb expresses reservations about some of the ideas, he believes the cavernous feeling of the new 6,000-seat stadium that surrounds his track should help. As well as its size, there are other features built into the Olympic stadium to help achieve high speeds. Two of these came at the recommendation of Sir Chris Hoy. The first is that the temperature shouldn’t drop whenever a door is opened – thus all entrances to the track are double-doored. And while this conforms to Team GB’s perspective of warmer is faster, Webb isn’t so impressed. Because of this, Webb has made an arrangement with the ODA that there will be no high heating on as the track beds in over the next few months. Hoy’s other recommendation concerns a ring of seats all the way around the track to prevent the ‘wall of silence’ riders can experience on the banking where there are typically few spectators. Although, like on most tracks, the multiple rows of seats along the straights taper away into the falling roof and rising trackside on the curves, there will be at least three rows of seats all the way around. Behind these rows at the ends of the track you can see large windows that form a ribbon all the way around the stadium. When the velodrome is completed and the protective coating comes off, these will combine with the long strips of skylight to let in plenty of natural light. Although seats had yet to be attached when we visited, an abundance of wood panelling – and the Olympic ban on on-track advertising – mean the finished product will look exquisite. From the outside, the velodrome is shaping up to look equally classy. When we stepped out, men in half a dozen cherry pickers were fixing sustainably sourced western red cedar cladding to the outer walls. 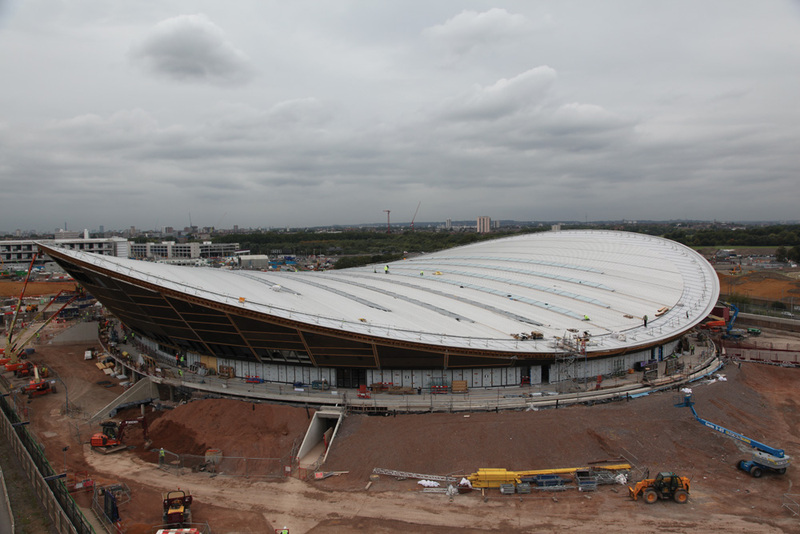 On top, the Pringle-shaped roof defines the velodrome’s sleek, space-age form. And with the bowl of the velodrome buried four metres into the landscaped earth, the aforementioned ring of glass sits at ground level to create an illusion that the velodrome is hovering. Unlike most velodromes we’ve visited, this one is a stunning piece of architecture. There is, however, a flipside to the iconic roof. Supposedly designed to reflect the geometry of the cycle track, from the inside, it conversely struck me of being at odds with the track’s dynamic. Where the track rises for the banking, the ceiling at the ends sinks towards it. As the track drops into the straights, it curls up high into the gods. From the top seats – while not obscuring a view of the track itself – the ceiling interferes with your line of vision. That makes me feel slightly uneasy. And while I realise this is very much a pernickety personal view, it perhaps also relates to Webb’s comments on claustrophobia. For a rider high on the banking, will that dipping roof also seem too close? Then again, with the seating configuration, perhaps the crowd will raise it. Back down at track level, I was walked around the boards by chief track builder PJ Lane, who has worked alongside Webb since building the Meadowbank track in Edinburgh. Along with twenty five colleagues from Irish firm Cornerstone Construction, he had been assigned to London for the nine-week track build. “It’s definitely the best track I’ve ever worked on,” he enthused before explaining how it all took shape. The track rests on 356 trusses, each one varying in angle. On top of that lies the racing surface: strips of 40mm-wide prime Siberian pine. Lane explained that most of these are of between 5.1 and 6.1 metres in length, pre-machined and washed, with knots that are as small as possible. 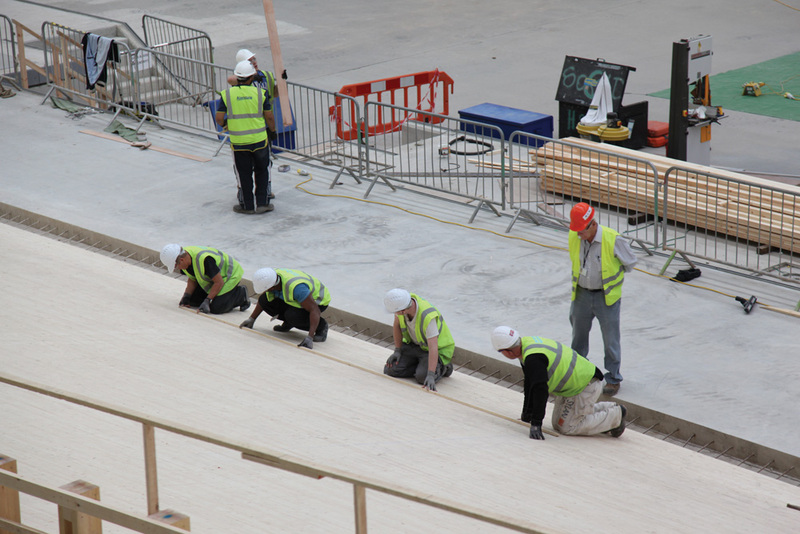 By the time the track had been completed last week, the workers had gone over every centimetre of it, sanding edges and filling gapped joins. The quality of the timber is a highly important matter. Webb explained that the builders had been forced into rejecting the first batch after the agency appointed with handling supplies for the Olympic Park had initially ordered from an inferior source. After the track is built, Webb doesn’t anticipate being involved in its maintenance but believes it should last for 30 or 40 years. “The surface got changed in Manchester a few years ago and I never thought it was necessary,” he said. “All that was wrong was it was dirty. If you looked at cut-offs of the timber that came off, it never even went in half a millimetre. The ODA announced completion of the timber parts of the track last Thursday, with the racing surface due to be covered with a plastic membrane. It will thus be ‘mothballed’ while being allowed to breathe. Not until the rest of the stadium is completed and the track UCI inspected, will the boards actually be ridden on for the first time.